I would like to thank you for putting your trust in me to serve as your Sheriff. 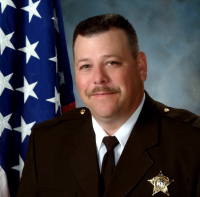 I have been serving as Sheriff since August of 2007. My law enforcement service to Orange County began in 1987 as a patrol deputy, and from there, I worked my way up the ranks to the position of Chief Deputy, prior to becoming your Sheriff. We run many programs such as the Citizen’s Police Academy, Neighborhood Watch Program, and TRIAD. This office operates on the principle of three (3) core values; Integrity, service, and leadership. I feel that if all of our employees practice these values that it will ultimately provide the best service and protection to the Citizens of Orange County. I took an oath, as your Sheriff, to provide the citizens of Orange County with the finest Sheriff’s Office that I can possibly assemble. In the coming years, I promise to continue to provide the programs that we currently sponsor, to investigate all criminal complaints to the best of our ability and to provide the best service possible. I am always available to you if you have need of me and my door is always open for you at the Sheriff’s Office.